To process an array in your logic app, you can create a "Foreach" loop. This loop repeats one or more actions on each item in the array. For limits on the number of array items that "Foreach" loops can process, see Limits and configuration. To repeat actions until a condition gets met or a state changes, you can create an "Until" loop. Your logic app first runs all the actions inside the loop, and then checks the condition or state. If the condition is met, the loop stops. Otherwise, the loop repeats. 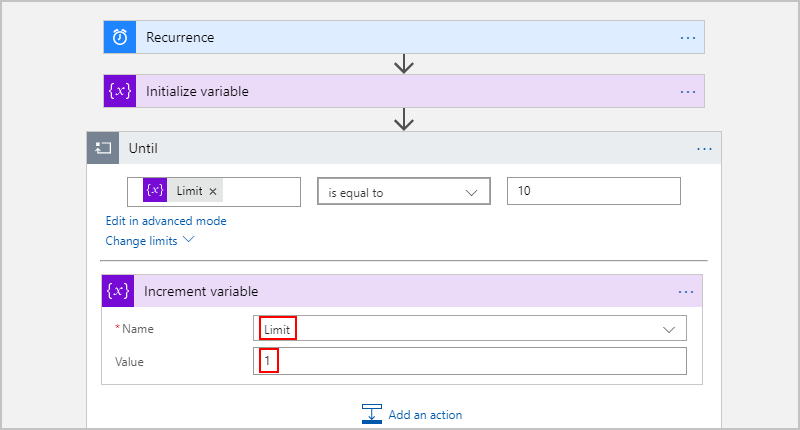 For limits on the number of "Until" loops in a logic app run, see Limits and configuration. If you have a trigger that receives an array and want to run a workflow for each array item, you can debatch that array with the SplitOn trigger property. An Azure subscription. 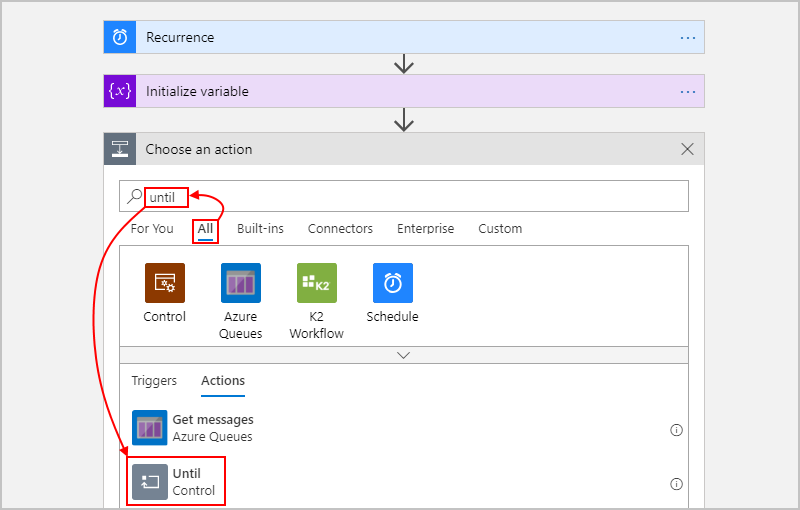 If you don't have a subscription, sign up for a free Azure account. A "Foreach loop" repeats one or more actions on each array item and works only on arrays. Iterations in a "Foreach" loop run in parallel. However, you can run iterations one at a time by setting up a sequential "Foreach" loop. In nested loops, iterations always run sequentially, not in parallel. 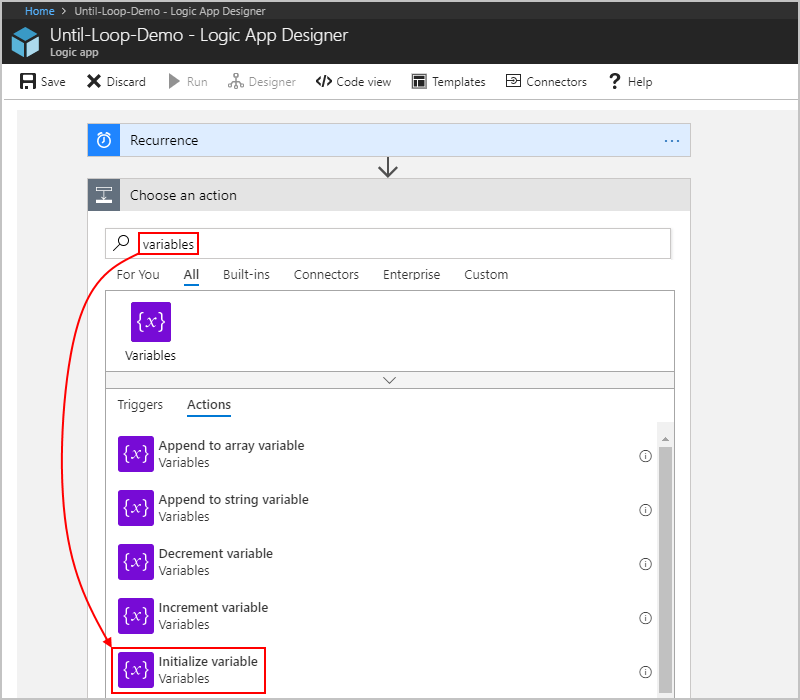 To run operations in parallel for items in a nested loop, create and call a child logic app. To get predictable results from operations on variables during each loop iteration, run those loops sequentially. For example, when a concurrently running loop ends, the increment, decrement, and append to variable operations return predictable results. However, during each iteration in the concurrently running loop, these operations might return unpredictable results. Actions in a "Foreach" loop use the @item() expression to reference and process each item in the array. If you specify data that's not in an array, the logic app workflow fails. This example logic app sends a daily summary for a website RSS feed. The app uses a "Foreach" loop that sends an email for each new item. 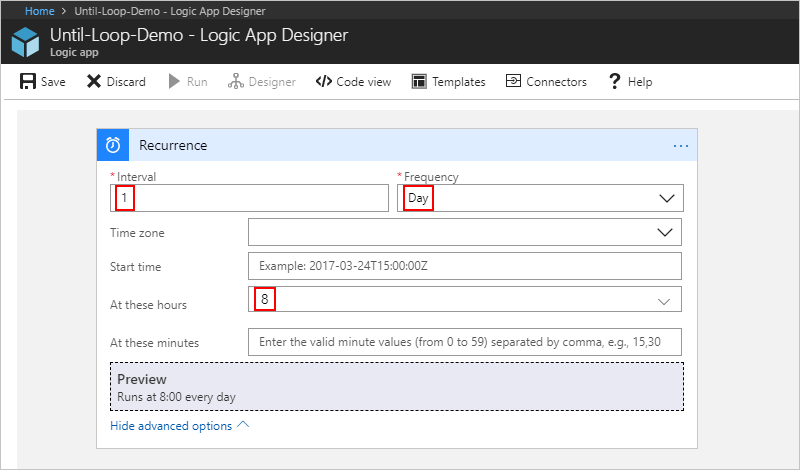 Create this sample logic app with an Outlook.com or Office 365 Outlook account. Between the RSS trigger and send email action, add a "Foreach" loop. To add a loop between steps, move your pointer over the arrow between those steps. Choose the plus sign (+) that appears, then select Add an action. Now build the loop. 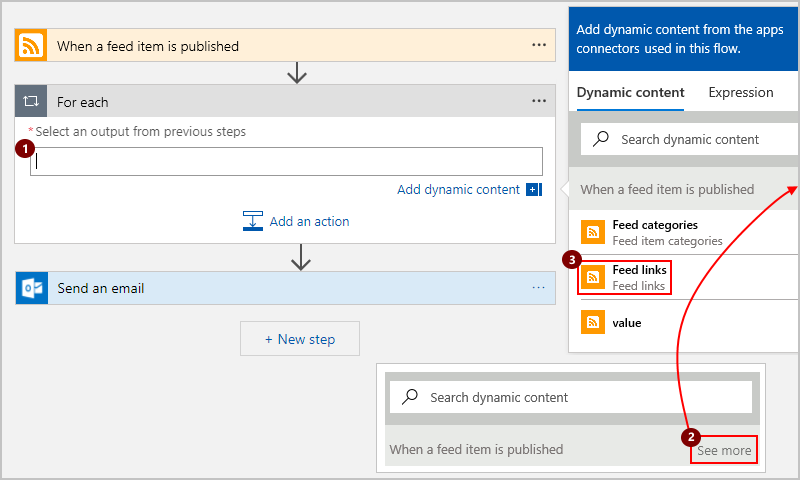 Under Select an output from previous steps after the Add dynamic content list appears, select the Feed links array, which is output from the RSS trigger. You can select only array outputs from the previous step. 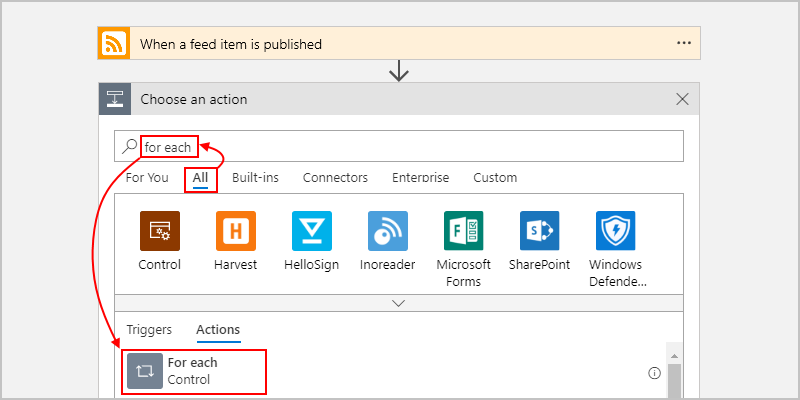 To run an action on each array item, drag the Send an email action into the loop. Save your logic app. To manually test your logic app, on the designer toolbar, choose Run. By default, cycles in a "Foreach" loop run in parallel. To run each cycle sequentially, set the loop's Sequential option. "Foreach" loops must run sequentially when you have nested loops or variables inside loops where you expect predictable results. In the loop's upper right corner, choose ellipses (...) > Settings. 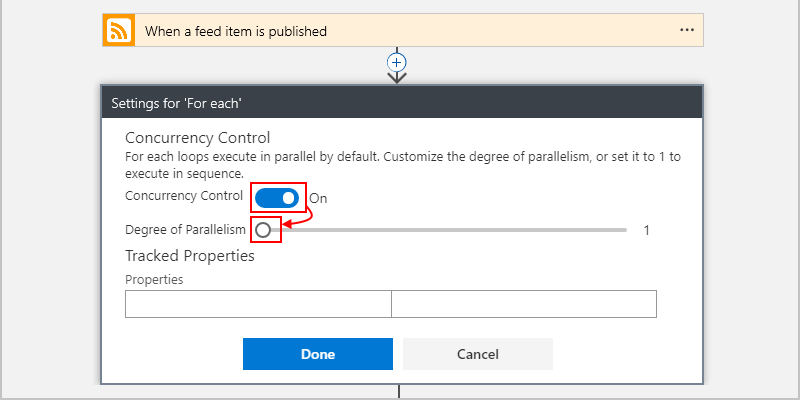 Under Concurrency Control, turn the Concurrency Control setting to On. Move the Degree of Parallelism slider to 1, and choose Done. To run and repeat actions until a condition gets met or a state changes, put those actions in an "Until" loop. Your logic app first runs any and all actions inside the loop, and then checks the condition or state. If the condition is met, the loop stops. Otherwise, the loop repeats. Call an endpoint until you get the response you want. Create a record in a database. Wait until a specific field in that record gets approved. Continue processing. Starting at 8:00 AM each day, this example logic app increments a variable until the variable's value equals 10. The logic app then sends an email that confirms the current value. 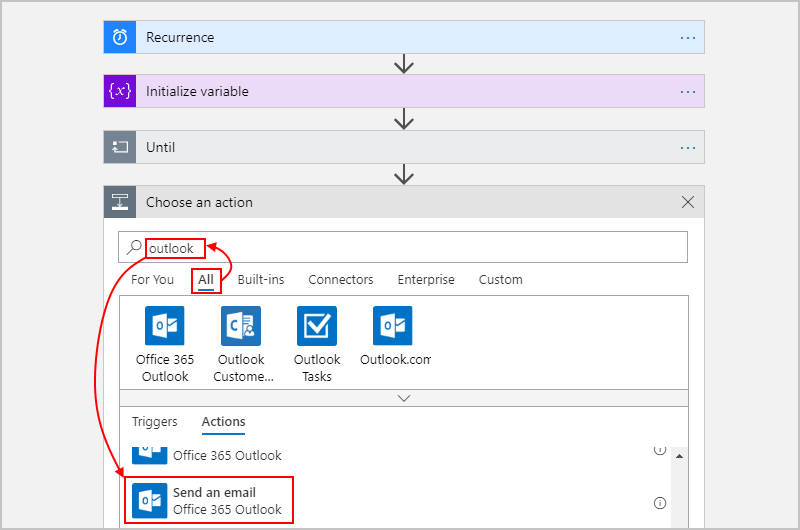 These steps use Office 365 Outlook, but you can use any email provider that Logic Apps supports. Check the connectors list here. If you use another email account, the general steps stay the same, but your UI might look slightly different. Specify when the trigger fires by setting the interval, frequency, and hour of the day. To set the hour, choose Show advanced options. Under the Initialize variable action, choose New step. 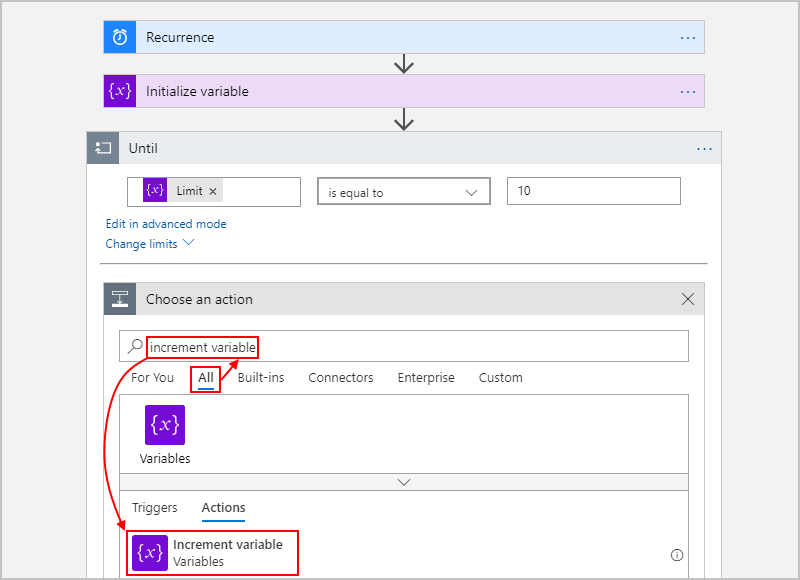 Build the loop's exit condition by selecting the Limit variable and the is equal operator. Enter 10 as the comparison value. Inside the loop, choose Add an action. For Name, select the Limit variable. For Value, enter "1". Outside and under the loop, choose New step. To <email-address@domain> The recipient's email address. For testing, use your own email address. Subject Current value for "Limit" is Limit Specify the email subject. For this example, make sure that you include the Limit variable. Body <email-content> Specify the email message content you want to send. For this example, enter whatever text you like. Count 60 The highest number of loops that run before the loop exits. The default is 60 cycles. Timeout PT1H The most amount of time to run a loop before the loop exits. The default is one hour and is specified in ISO 8601 format. The timeout value is evaluated for each loop cycle. If any action in the loop takes longer than the timeout limit, the current cycle doesn't stop. However, the next cycle doesn't start because the limit condition isn't met. To change these default limits, choose Show advanced options in the loop action shape. // includes these default limits that stop the loop. The loop ran 10 times as specified by the count attribute. The default is 60 times. The loop ran for two hours as specified by the timeout attribute in ISO 8601 format. The default is one hour. 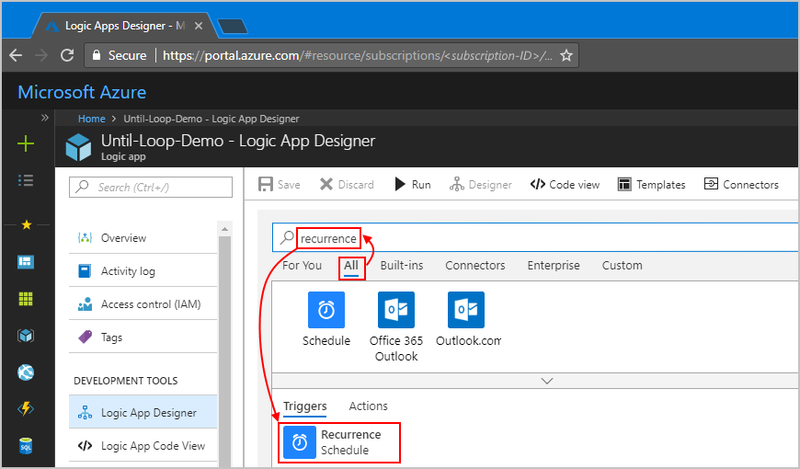 To submit or vote on features and suggestions, Azure Logic Apps user feedback site.